I enjoy Hong Kong action films. The themes of honor, battle, and "always having two guns" can often lead to compelling cinema. Genre masters like John Woo and Tsui Hark find unique ways to make even the most generic picture seem interesting. Unfortunately, even this heralded genre is bound to produce some duds, and Another Meltdown is one of the worst offenders. Originally titled The Blacksheep Affair, this mentally disabling picture has been renamed to make viewers think it's a sequel to the 1995 Jet Li vehicle, Meltdown. Discerning action lovers will not be fooled by the familiar situations and insulting plot developments. Yim Dong (Chiu Man-Cheuk) is a terrorist-battling officer with crazy martial-arts skills who has intense devotion for his country. Dubbed in English as Arthur (sometimes even in the foreign-language tracks), this guy is willing to disobey orders to ensure that terrorists don't go free. In the action-packed teaser, he ignores his superior and chases after an airplane filled with hostages. Although he saves the day, this rash action gets Yim/Arthur transferred to the fictional country of Lavernia. A former member of the Soviet Union (I think), this English-speaking land contains a sad collection of racist white guys who will shoot innocent Chinese people and not bother to "ask questions later." The main villain is an evil Japanese cult leader named Keizo Mishima (Andrew Lin Hoi), who kills for vague religious reasons. By a stroke of luck, Yim and his partner, Hung Wai-Kwok (Ken Wong), capture the notorious leader, which brings them into a dangerous battle for their lives. It's difficult for me to even discuss the plot without cringing at its numerous frustrating elements. The human relationships are very dull and lack even minor areas of interest. Yim/Arthur is lucky enough to arrive at the exact place where his former love, Chan Pun (Qi Shu), fled in 1989. She is an attractive girl, but has absolutely nothing to do other than screaming his name whenever trouble arises. Our hero may showcase some impressive moves, but his stern and unconvincing demeanor never draws us into the tale. Mishima has an interesting look, but his ideas are laughable and impossible to take seriously. Director Allun Lam has yet to film another picture in the past five years, which is understandable given this unimpressive work. With the exception of one energetic sequence involving rocket launchers, this picture fails to meet any and all of my action-film expectations. Countless scenes are too dark and need more precise editing to really deliver a strong punch. Lam has adopted many clich�d moments from popular films�including the airplane hostage crisis and the impending subway fight�but the scenes lack any individuality. Viewers looking for a mindless night of Hong Kong cinema cannot do much worse than this movie. Image Transfer Review: Another Meltdown utilizes a dull 1.85:1 widescreen transfer that provides virtually no impressive visual moments. The picture contains far too much grain and other defects that hinder its effectiveness. Colors are muted and lack the sharpness usually associated with DVD transfers. The overall result is not a complete failure, but few elements distinguish this version from a basic television presentation. Audio Transfer Review: This release contains three separate 5.1-channel Dolby Digital audio transfers that are surprisingly unimpressive for the format. The sounds remain mostly centralized and provide only a moderate level of power. Considering this film's action-packed nature, not having a nastier transfer is a major problem. The sound quality is decent enough, but is missing the top-notch clarity of the best releases. This movie is available in dubbed English, Cantonese, and Mandarin, but all three actually include a considerable amount of dubbed English dialogue. Extras Review: Another Meltdown is devoid of extra features save for a few trailers and a photo gallery. 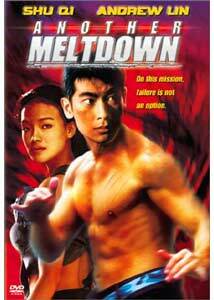 This disc includes decent full-frame trailers for this picture, its predecessor Meltdown (starring Jet Li), and the Jeff Bridges drama Scenes of the Crime . It also contains widescreen previews for The Sea Is Watching and So Close. The photo gallery provides 14 color pictures from the film that appear in a stylish menu setup. Another Meltdown falls ridiculously short of the standards set by numerous successful Hong Kong pictures. It tackles a wealth of genre conventions and actually lowers the bar in terms of character development and production values. Action fanatics might enjoy this film because of it is so unbelievably bad, but I couldn't get past its many shortcomings.